Yayoi Asoma is an artist and educator living and working in Brooklyn, NY. She received her BFA in Painting from the Rhode Island School of Design, Providence, RI and her MFA in Visual Arts from Mason Gross School of the Arts, Rutgers University, New Brunswick, NJ. Recent solo and group exhibitions of her work include The Grass is Greener on the Other Side...So What?, Leo Fortuna Gallery, Hudson, NY;Artist As Teacher, The Studio, Armonk, NY; Passages (2004), OSLO, Brooklyn, NY; Drawings (2006), Agora Gallery, Knoxville, TN; Summer Exhibition, Gallery 17 Peck, Providence, RI and her work has been reviewed in the New York Times. Asoma is an adjunct professor at Manhattanville College in Purchase, NY and teaches at public schools in New York City through Studio in a School. The exhibition at CUE Art Foundation marks Asoma's first solo show in New York. Stephen Westfall is an artist and writer living in New York, NY. His paintings are represented by the Lennon Weinberg Gallery in New York, NY and Galerie Wilma Lock in Sankt Gallen, Switzerland. His work is included in the collections of The Albertina Palais Museum, Vienna, Austria; Rubin Museum of Art, New York, NY; the Hammer Museum, Los Angeles, CA; The Baltimore Museum of Art, Baltimore, MD; The Kemper Museum of Contemporary Art, Kansas City, MO; The Munson Williams Proctor Arts Institute, Utica, NY; and The Louisanna Museum of Moderne Kunst, Hammelbak, Denmark. He was named a Guggenheim Fellow in Painting in 2007 and has received the Nancy Graves Fellowship, the Academy Award and Purchase Prize from the American Academy of Arts and Letters, three NEA awards and two New York Sate Council in the Arts awards. He is currently an Assistant Professor at the Mason Gross School of the Arts at Rutgers University, New Brunswick, NJ and is the Painting Co-Chair of the Bard College MFA program, Annandale-on-Hudson, NY. Westfall is a well known art critic, independent curator and a contributing editor to Art in America. My paintings are built through exploring the notion of recollection. I am interested in how memory works as a constructive process that reproduces, filters, changes and interprets the past. My work speaks through the familiarity of the home, where spaces of our everyday lives entwine perpetually with the memories and associations of our experiences. While a house is often referred to as a home, the concept of "home" is broader than a physical dwelling. Home is often a place of refuge and safety, where worldly cares fade. Home is an experience as much as a specific place. In my earlier works, I worked to recreate the spaces of my home directly from memory. I documented the spaces with the scrupulous care of a witness, but even the best witnesses lie, misremember and miss important details. Preoccupied with how memory should look, I relied too much upon a "logical" understanding of space. The basis of my paintings has since shifted and I now use photographic images as a starting point. The photographic source helps me grasp and portray the specific nature of the space. In addition, I am intrigued by the flat surface of a photograph and the camera's ability to unsympathetically frame a space. I very rarely work from a single photograph. Instead, I revive the image source through the process of photocopy, Photoshop and collage. This sifting process enables the generation of a new image-one that is estranged from its original source and serves as the guideline in the construction of the often fragmented and disintegrated spaces in my paintings. The final compositions of my paintings incorporate several different views of the space, shifting spatial relationships and creating fractures and pockets. Ultimately, I paint to make new spaces-creating paintings within paintings and rooms within rooms, with thick layers of paint and densely overlapping perspectives. To spend time in front of these paintings is to see them change. Figures and objects move in and out of the viewer's attention, as each painting seems to present an analysis of the processes of seeing and remembering. Yayoi Asoma's spectacular paintings have the humblest of beginnings, from photographs and memories of the house she grew up in, in Chappaqua, NY, where her parents still live. 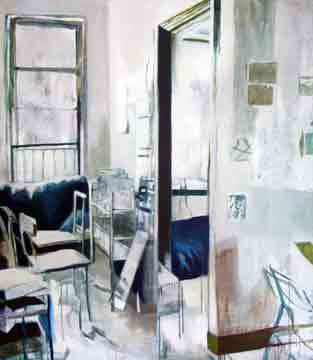 As they manifest in a gallery space of appropriate scale, the paintings expand their biographical material into a grand formal display of something that we may have not known or forgotten we were missing: the potential of a post-Cubist representational space to intensify an experience of a thing or place rather than confuse it or render it nostalgic. I think this is so because, since Matisse, post-Cubist rupture of a coherent pictorial space (the equivalent of montage in film or theatre) has largely disappeared, or else has been submerged so deep into pictorial structure as to be non-declarative even as it torques the entire spatial field, as in the paintings of Malcom Morley, Lucian Freud, and Rackstraw Downes. The closest compositional analogs to Asoma's panoramic sequences of breaks and sudden vectors might be David Hockney's reiteration of post-Cubist space in his photo-collages and Gordon Matta-Clark's photo documentations of his swooping cuts into buildings. But these are photographs, not paintings. Their surfaces are missing the tactile "feeling out" of the painted mark and, by literal extension, the reach of the body in real space. Not Asoma's paintings. Photography for her is a starting point, a kind of note taking or an on site sketch. 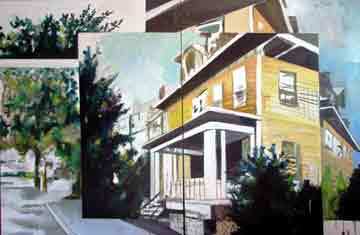 Back in her painting studio, photographs of interiors and exteriors of the Chappaqua home are pieced together and adjusted for some equipoise between transitions that make narrative sense and abrupt breaks that shift scale, bring light into dramatic collisions with shadow, and establish a corollary between shifts in spatial vectors and levels of memory. Perhaps most importantly, the photographic elements are blown up to a scale where painting more productively takes over as a rendering process, not to preserve the material integrity of the grain of a working print, but to establish another level of presence at a scale where the photographic grain starts to break down, or else lose any connection to the scale of human application (in their technologically jaw-dropping cohesion, the prints of Andreas Gursky or Thomas Struth only confirm this apprehension). Asoma's paintings are dream like without the irruptions of the id (that would be Surrealism). Their spaces adhere to the eye in the manner of dream space, which seems to follow us as subjects. As our eye moves through the exteriors, or around the exteriors of the home we are aware that every plane, every splinter or fragment of a view, even those at steep angles of perspective, is directly addressed to the gaze. Simultaneously, the paint surface, built up in transparent or semi-transparent washes, advances as a material presence, delicate but insistent in its buildup. Bonnard does something similar, but usually with a smaller and less loaded brush (fewer drips in Bonnard). And Asoma's palette is narrower than that of Bonnard's mature paintings; she stays in the grays and greens of the early Nabis. I think this at least partly because a broader and warmer chromatic range would undermine the elegiac undertow of her otherwise monumental pictorial constructions. This is the house she grew up in, through and around which she wanders, or floats as if in a dream. The paintings draw the viewer's full body into her dream, close to the literal scale of both the interior and exterior of a house viewed at the site and the concrete scale of the artist's body making a painting across such an area. So it's more than a dream or a memory that's present here. It's a fresh mapping of sensation achieved through a reawakening of dormant formal methods. This is an auspicious beginning for a young painter setting out, but I think these paintings would be impressive for a painter at any age.